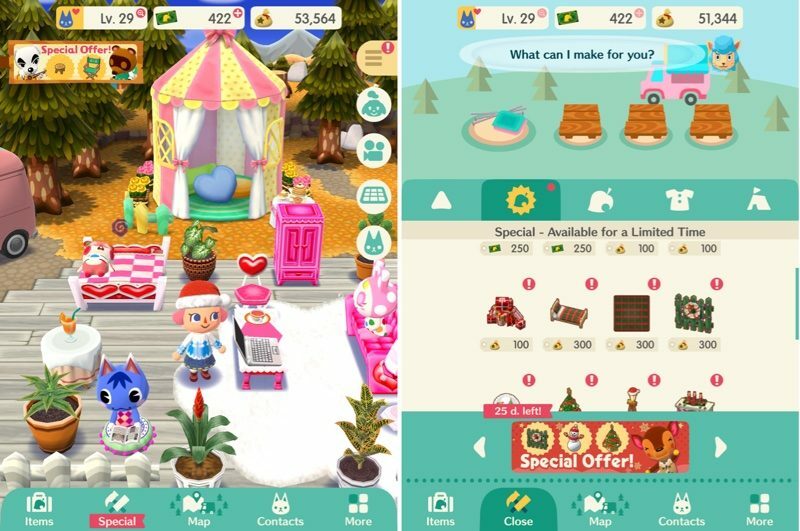 Nintendo last week launched its newest iOS game, a mobile version of Animal Crossing called Pocket Camp, and it's already being updated with new content in the form of a special holiday event. Typical Animal Crossing games feature special events that take place on a regular basis, and it appears Animal Crossing: Pocket Camp is no exception. The new Christmas-themed event will allow players to earn limited-time clothing items and craft holiday-themed furniture. To get the holiday items, players need to fulfill timed goals and complete quests for visiting animals to earn candy canes, so the holiday gameplay is essentially identical to standard gameplay, but with the ability to earn special items. It takes a lot of candy canes to unlock items, but Nintendo's event will last from November 29 to December 25. My girlfriend and I are addicted to this game! She’s level 30+ and I’m almost 28. Best free to play game I’ve downloaded in a long time (I haven’t played any of the other Animal Crossing games). You know, I gave this game a try, and I think that Nintendo did a great job with it aside from one critical flaw. It still feels like Animal Crossing. Damn. Who would have expected that? Animal Crossing feels like… Animal Crossing. I think you should start a petition online to complain about that. Wish there was a way to buy the full original game. This is fun but limited. Would love to be able to plant trees and flowers and put things in the museum. I’m hooked too. I’m level 29. My husband is into some other game right now and hasn’t played much. Everyone else in the family is into some other game on 3DS or lol, busy with homework, so I’m pretty much the only one playing a lot. Most of my friends seem to be Japanese judging from the characters used for the names. I have a couple of people who are European. And two with American or Australian names. I think I like this game a little better than the other “real” Animal Crossing games because I can pop in and pop out without worrying about missing specific events. I find it relaxing. The animals are still cute. There’s not a lot of depth to it but in the chunks of time in which I have to play, it is entertaining enough. It kills the battery on my X fast though. Today I decided to play it on my 7 Plus as much as possible and save the battery on my X.